The Fijian Government and the United Nations have jointly launched a US$38.6 million Humanitarian Emergency Appeal for the 350,000 people affected by Severe Tropical Cyclone Winston that is aimed at complementing the relief efforts of the Fijian Government to date. “With our tenacity and the generosity of UN member states, we must work together to meet the unprecedented need that Cyclone Winston has left in its wake. We look to the world to assist Fiji to fully get back on its feet,” the Prime Minister of Fiji, Voreqe Bainimarama said at today’s launch of the Appeal. 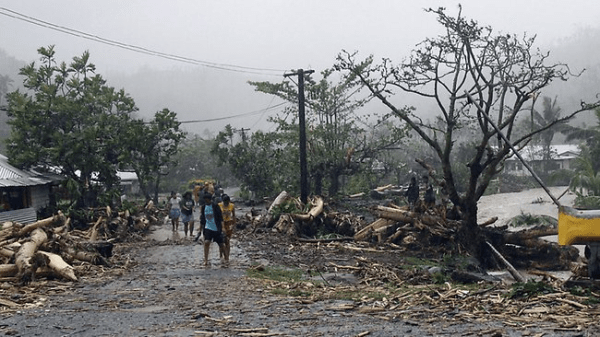 The cyclone and a massive storm surge left a path of destruction across Fiji on 20 and 21 February, leaving more than 40 people dead, destroying an estimated 24,000 houses and wiping out life-sustaining food crops. “The Fijian Government deserves praise for its strong leadership throughout the early stages of this complex response but with 40 per cent of the population affected, there is now an urgent need for international support to fund critical activities over the next three months,” United Nations Humanitarian Coordinator, Osnat Lubrani,said. In partnership with the Fijian Government, a Humanitarian Emergency Appeal has been developed covering urgent lifesaving projects that require US$ 38.6 million in support from the international donor community. “The United Nations stands shoulder-to-shoulder with the people of Fiji and its government as they respond to the catastrophic impacts of Tropical Cyclone Winston. On behalf of people affected by this disaster I urge the international community to give generously to this appeal,” Ms Lubrani said. The Fijian Government estimates the cost of the damage from Cyclone Winston will top FJ$1 billion (US$ 500 million). Shelter, health, food security, water, sanitation and hygiene, education and protection have been identified as the most urgent needs and are all covered by projects in this appeal. “There is a critical need for the construction of emergency shelter in the worst hit areas with more than 50,000 people temporarily displaced. Hospitals and medical facilities have been destroyed or damaged, and water sources are contaminated. There is a huge demand for debris clearance and a need for the rapid provision of clean water and sanitation services to reduce the spread of disease,” Sune Gudnitz, Head of the United Nations Pacific Office for the Coordination of Humanitarian Affairs. With the loss of 100 per cent of crops in some areas and serious damage to boats, fishing equipment and food gardens, the humanitarian community is anxious to provide people with access to food, as well as seeds and other agricultural inputs and fishing supplies. “A top priority for the Government is the provision of temporary classrooms with water and sanitation facilities and learning materials in damaged schools so that students can re-start their education and return to normalcy,” Mr Gudnitz said. This kind of appeal is an internationally recognised tool used to quickly secure funds for United Nations Agencies and non-government organisations (NGOs), to support a Government’s response to an emergency.This appeal is a preliminary estimate of needs that is based on currently available information and is open to revision as assessments are completed.